Hi guys. I'm not dead yet. I am not playing much at all these days but I have another grandson who is turning out to be an amazing guitarist. He asked for a guitar kit last Christmas and he wanted a heavy metal guitar. So his dad got him a Rocktile kit. The guitar has a Floyd Rose licensed tremolo, but within two months he had stripped the bolts in the locking nut and then on the bridge. He stuck it in for repair, but the shop was going to charge more than a new guitar. I had had a shot playing it, but it was a nightmare, with strings so far off the fret board and the bridge all out of kilter. He has been playing his other granddad's Squier Strat and is now an extremely competent guitarist. Better than I ever was. Every time I visit, I take another guitar down for him to try (I still have 10 and my bass). Unfortunately, we do not see him very often. We were down last Saturday and he was playing a borrowed Squier acoustic, and making a lovely job of Stairway to Heaven (I told him never to play that in a guitar shop!). The Rocktile was lying in a corner, minus nut and strings, so I said I would take it away and see what I could do. The electrics were fairly good but a little noisy, so while I waited for the bridge I painted out the cavity with shielding paint and added an earth wire. I also tapped down a couple of high frets and oiled the fret board. I finally got down to putting it all together today, my first ever experience with a Floyd Rose, and what a struggle. They always say to replace one string at a time and now I know why. I had to replace the pivot posts, shim the nut (too low) and even shim the side of the neck, to get the strings middle for diddle. Basic tuning was the biggest pain ever as every time you tension one string all the others go out of tune. Add to that keeping the bridge level and it was a labour of Hercules. Once I got it set up, with the action nicely set, I checked the truss rod setting and thankfully it was just as I like it. The intonation was spot on too, so now it is just a case of playing it until next time I see him, and adjust it as it settles in. Kinda put me in the mood! The whole story is just so you, Jocko, doing what you always seem to have been doing: helping and encouraging others. I hope they appreciate it and you at least get some enjoyment out of their success. Nice job Jocko! I agree with Lester, it's very you to do all this, with customary care and attention. I think what you say probably puts me off ever getting a locking nut floyd rose type guitar, not that it was ever likely anyhow. Horses for courses of course though. I do remember the maze of different guitar types/brands/prices and not knowing what was a good buy or not when I was starting out - it would have been useful to have someone like yourself to turn to for help back then. I will never have one. Because there were no strings on it originally I took 2 and a bit hours to restring and tune it. "let's cut a big hole in the back, and then we can balance the bridge on some pivot thingys instead of fixing it properly to the body, and we'll have springs balancing the string tension in the hole... won't that be great?" Erm, no!, in my book. But as a true hypocrite, I am planning to set the trem unit floating, at least at first, for my new strat build. On my other strats, I have the trem firmly decked to the body, so it acts like a fixed bridge. Floyd Roses, with the added complications you've talked about, and that blinking locking nut - don't get me started, but not for me. But rant over - I do think with problem guitars, there's often a decent one struggling to get out, and it just needs someone with the patience, care and attention of yourself to free it. So lovely work there Jocko. Can't he just strum a power chord and, like, shake the guitar ? Been playing the guitar for a couple of hours now and it plays remarkably well. It is what I have always said. A cheap guitar can be dramatically improved by a good set up. I had to remove the output jack socket, give it a clean and a skoosh of Servisol, as it was a bit crackly, but it is great now. Working on the old "Two Lane Highway", as recorded by Pure Prairie League. I am loving playing this guitar. Or maybe it is just "guitar" I am loving playing. I use Reaper, and I have a whole load of tracks from Karaoke Versions where I can leave out the part I want to play (usually the rhythm track). I have spent the last couple of hours playing all my favourites. Maybe I should go and pull a good guitar out and see how I enjoy that! You're a brave man tackling a Floyd Rose like that Jocko. Very well done for getting the task done, and I agree 100% about how often a cheap guitar can be pretty good if it only had a decent set up. But like one of the big chain guitar shops near me said - "if it's playable when it arrives from the factory we put it on display - we'll only adjust the set up if it's unplayable". Not doing budding guitarists any favours at all, and doesn't encourage me to put business their way. It could well have come from the same shop, as my grandson is in Tranent! That is the Rocktile played within an inch of its life, nicely settled and ready to return to my grandson. I fitted straplocks, so I hope he likes my choice of strap. 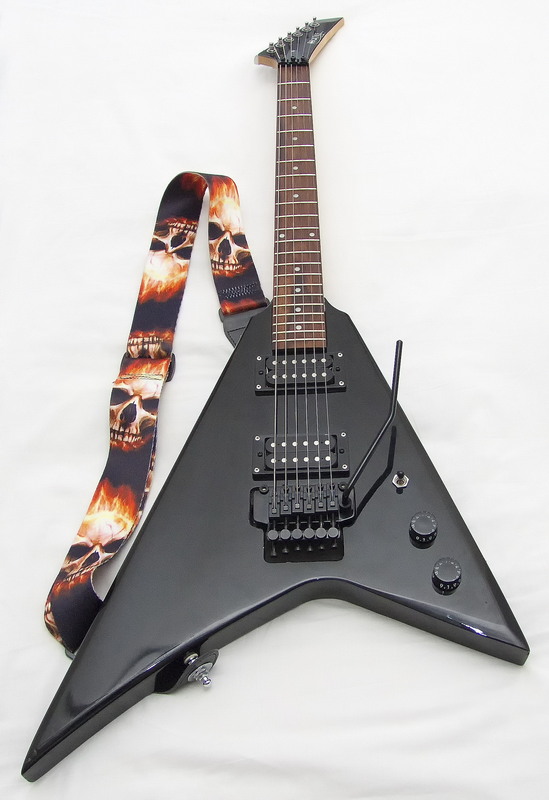 The new Floyd Rose looks rather smart in black. That looks the part - one mean machine with a strap to match! Hopefully the end result makes you feel your herculean efforts were worthwhile. One lucky boy to have a granddad who can turn his had to projects like this.